I’ve recently been on a pasta making binge. It’s weird, but once Sunday rolls around I feel the need to roll out some dough, and eat some comfort food. 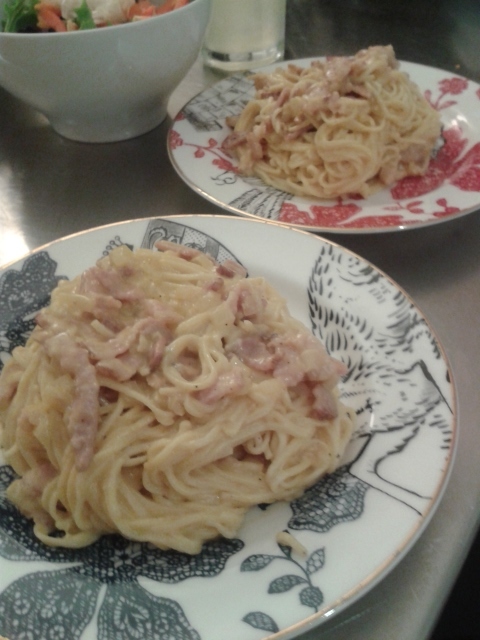 This past Sunday, I had some leftover eggs, cream, and bacon, and I though why not revisit an old friend: Spaghetti alla Carbonara. Some sources trace the etymology of the dish to the coal miners in Italy of days of yore, and that “carbonara” is a derivative of “carbonaro”, or charcoal burner. This is quite appropriate, because mastering this recipe is all about mastering heat (you don’t want to overcook the eggs at get stuck with clumps of yolk rather than an unctuous sauce). It has also been linked to an old Roman dish called “cacio e uova”, to which prosciutto was added later in the life of the dish. A few other possibilities are proposed here. Whatever its origins, there is something rather special about the creamy sauce and saltiness of the prosciutto (or bacon…though I prefer prosciutto) that hits the spot. The recipe I’ve found to be a consistent winner is one I’ve adapted from the Chez Piggy Cookbook. It serves 4. While you prepare your ingredients, get a big pot of salted water to a rolling boil. Harold McGee suggests using 10 times the pasta’s weight in water. I concur. There is nothing worst than using too little water, and losing that beautiful rolling boil the second your pasta hits it (and absorbs all of the heat). Sauté the onions in a medium-hot frying pan until the start to soften and become translucent. Then, add your prosciutto or bacon. At this point, you should be adding your pasta to the boiling water and cook per the instructions. Once your prosciutto turns a beautiful coral pink (or once your bacon is just cooked through), add the cheese and cream to the frying pan, and mix until well combined and heated up. Turn off the heat. In a separate, large bowl (and this is key because you want enough room to mix the other ingredients in later) add the egg yolks and mix enough to break them up into a nice, even orange paste but don’t mix to vigorously or else they’ll take in too much air. Set aside about 5-7 Tbsp of the pasta water (this stuff is gold), strain your pasta, and then add the pasta to your bowl of egg yolks. Coat your pasta with the yolks. To do so, keep the pasta moving so that the yolks don’t get a chance to set. You’re goal is a creamy sauce, not bits of hard boiled yolk. Once coated evenly, add your cream/cheese sauce to the bowl with 2-3 tablespoons of the pasta water you saved (it will thicken the dish slightly) and mix well. Serve it right away.